The articles and posts written here are to share Gina’s knowledge and experiences with others, and to provide you with an idea of how Abudi Consulting Group, LLC has helped a variety of clients – from non-profits to for-profit and from small to larger organizations. Additionally, through the use of the Phillips ROI Methodology®, Gina has worked with clients to evaluate the effectiveness of their project and process management initiatives. Please visit the "Consulting Services" page to learn more. 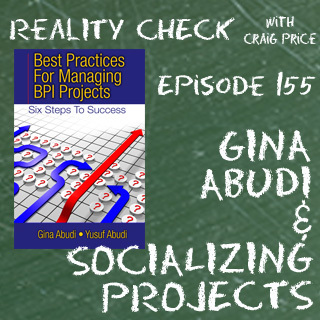 A bit about Gina: She is President of the Project Management Institute (PMI®) Massachusetts Bay Chapter Board of Directors. The PMI Mass Bay Chapter is one of the largest in the United States and in the top 6% of all chapters worldwide by size. The Chapter has over 2,300 members, including over 1,500 certified Project Management Professionals (PMP®). Visit the PMI Mass Bay Chapter website for more information about the Mass Bay Chapter. Gina is a frequent presenter and keynote at various conferences, industry forums, and corporate events on project and process management and management/leadership topics. She particularly enjoys sharing her knowledge with others and is a frequent contributor on LinkedIn discussions groups. Gina frequently holds 1- to 3-hour management and executive overview sessions to help clients spread the word about the benefits of focusing on project and process management within their companies. Additionally, she speaks frequently at industry events on a variety of topics. Your comments are welcome! If you are interested in consulting services, or in guest blogging, would like to talk further about one of these topics, interested in having Gina speak at a conference or event, or would like to publish one of these posts, please contact us. To see the most recent post, click on "Posts" on the navigation on the left. If there is a specific topic you are interested in, you can also type key words in the Search box on the right. You can also choose from the "Categories" drop down box on the left. Please visit the "Authors" page to see guest bloggers and their contributions. To see a list of recommended business readings, please click on "Suggested Readings" on the left. If you tweet – please follow Gina on Twitter. And please join her on FaceBook.